A recently leaked photo from the set of the untitled fourth Avengers film reveals Pepper Potts may finally be getting the Iron Man suit she deserves. 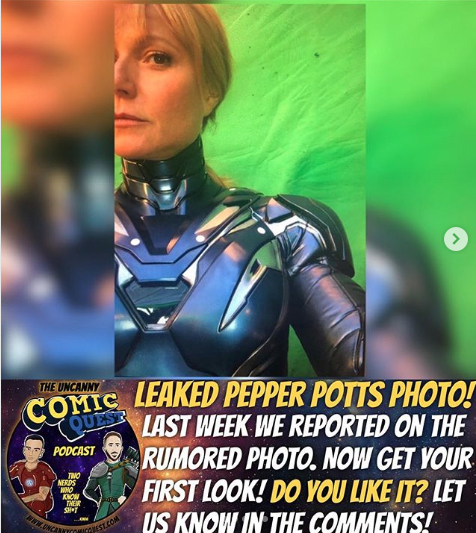 The photo, which appears to be a selfie, shows actress Gwyneth Paltrow posing in front of a green screen and sporting a high-neck, metallic purple and silver suit, complete with armored plating and what looks to be leather sleeves. The suit also appears to come with a hole in the chest plate which seems the perfect size to fit an energy source, much like what Tony Stark’s suits all feature. Marvel fans have long speculated Pepper will soon sport her own Iron Man armor after she briefly wore the suit Mark 42 in Iron Man 3. In fact, fans of the comics will remember Pepper would frequently don her own version of Tony’s suit that he made for her and go by the alias Rescue as she fought crime. This suit was also purple and silver, like the one the picture of Gwyneth teases. While exact details of Avengers 4 are being kept under wraps, a few other photo leaks have provided hints as to what we can expect from the upcoming installment. Toy designs from Hero Vision show a purple clad female character next to Iron Man wearing a strikingly similar armored suit, which fans were quick to speculate is Pepper in her Rescue outfit. Another photo showed Gwyneth on the set of Avengers 4 wearing a motion-capture suit, further indicating she will play a much larger role in the upcoming film. The last time we saw Pepper was with Tony Stark (Robert Downey Jr.) at the beginning of Avengers Infinity: War before he was recruited by Doctor Strange (Benedict Cumberbatch) to battle Thanos. We also know she survived Thanos’ climactic and disastrous universe wipe, so perhaps this new film will give her the chance to stretch her hero muscles and help save the day as Rescue. Yessssss!I love how filming is all wrapped up and everyone sends teaser Instagrams or twitter posts every few days to keep us all guessing and keep up the hype. Very smart machine those Disney/Marvel people are. They definitely keep you thinking about their films, no wonder they’re so successful. Their films are usually really good, too. Avengers Avengers: Infinity War Gwyneth Paltrow iron man Pepper Potts robert downey jr.